Subtitled “Daily Life on the Indies Fleets in the Sixteenth Century,” the book is a fascinating study of Spanish seafarers back in the heyday of the Spanish empire. In the century after Columbus’s discovery, maritime navigation changed dramatically. The voyages of discovery and conquest gave way to massive “fleets,” which would take merchandise and a few passengers to the New World and return with whatever riches they could, preferably precious metals. Life in those days was much more precarious than it is today, and probably somehow more vital too, and this is certainly reflected in the lives of sailors. The book starts with a look at Seville, the port city where all the journeys commenced. Seville was a city full of sailors, street urchins, pickpockets, and prostitutes, and curiously, significantly upriver from the ocean itself. Ships were a lot smaller in those days and were able to navigate the Guadalquivir upriver as far as Seville. So who went to sea? Seamen tended to be those who couldn’t make a go of it on land. Life at sea was so dangerous that it would be a mistake to think that sailors were mainly adventure seekers. The ship was like a floating prison, overcrowded and without privacy. Intense hard work and the danger of storms alternated with monotony. The crews were comprised mainly of sailors from Andalusia, from Spain’s northern coast, and of foreigners, such as Portuguese, Italians, and Catalans. Although you were allotted more than a liter of wine per day (the water from the barrels tasted horrible) the food was bad, pretty much hardtack and salted meat, with the occasional bland bean stew. The hardtack, or biscuit, was so hard that it had to be soaked in water or wine before it could be eaten. To give you an idea how tough some of those sailors were, there were those who, in the middle of the ocean, when the ship sprung a leak, could swim down and nail a lead plate over it. To pass the long hours when there wasn’t intense work to do, sailors would gossip, do some low-stakes gambling, and curse. They were in general a surly lot, although as the voyages became more predictable mutinies were increasingly rare. Cursing and gambling were prohibited, but prevalent anyway. There were occasionally women on board, some of them better versed in charity than in honesty. Homosexuality was considered a nefarious sin and could be punished severely, although it was occasionally practiced anyway. 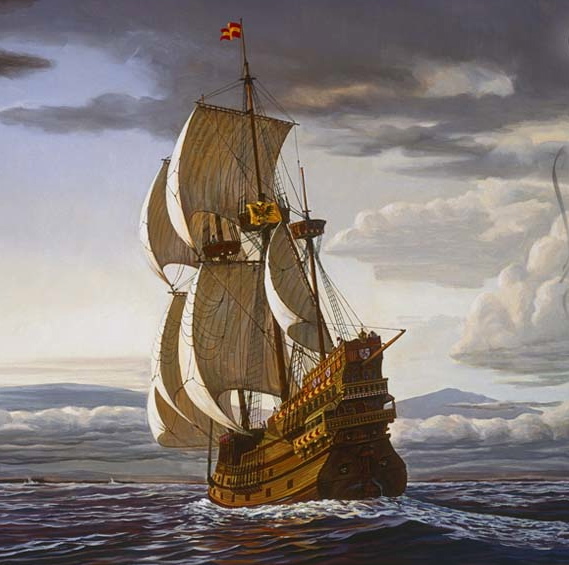 In the sixteenth century, the ocean-going ship was the most astonishing machine man had yet devised, with its complex system of ropes, pulleys, and sails. It is still impressive to think about how these ships could leave Seville, conquer the vast ocean and arrive in the Indies more than a month later. Due to the prevalence of pirates, the ships also needed to be well armed. In fact, the fleet system developed in order to make the journeys back and forth across the ocean safer. All in all, the book was an entertaining and informative read. I read Carla Rahn Phillips’ good English translation, although at times I wished I was reading the original Spanish, as when we are told that one sailor tells another, “You lie like an enormous rogue, you he-goat with a whore for a wife.” The many illustrations, several in color, are an added bonus. This is a history book that is interesting and well written enough to engage the non-specialist reader.